I've put together a buying guide for the Peugeot 306 GTi-6/Rallye, much of this is also applicable to any Peugeot 306. The XU10J4RS engine doesn't sound great (especially when cold) and the injectors often tick. However, it is very important to listen out for a more metallic tapping noise which is caused by snapped cambelt which has not been properly repaired. Snapped cambelts on the GTi-6/Rallye is very common due to the service interval originally recommended by Peugeot being approximately double the length it should have been. If a cambelt has snapped, the head will need to be stripped down/valves replaced etc. Considering the above, check the service history for when the cambelt was last changed - to be safe most owners like to do it every 30k miles or 3 years. The cost of this from a garage including waterpump/pulleys is approx £280. Whilst driving at about 3krpm, dip the clutch and check the idle stabilises and does not stall or bounce - this indicates a faulty idle control valve (easily fixed). Usual checks for any white creamy substance in the radiator or under oil cap. These engines should pull smoothly to just before the redline. The chassis where the upper engine mount (on the left by the cambelt) secures is known to fatique and break. Small cracks may go unnoticed but they can fail completely and the engine will rock all over the place. 1st to 2nd gear will sometimes be notchy when cold. Gearbox should not be noisy. There's lots of potential for knocks and creaks on the Peugeot 306 - droplinks, arb bushes, worn wishbone bushes, worn rear beam mounts, worn top mount bearings. Take it for a test drive over some bumpy roads and use your ears. Release the wheel when driving on a flat road and check the car tracks straight. Check the camber of the rear wheels, rear beam bearings are known to wear causing large amounts of negative camber. The rear ride height is set by two straight torsion bars not coil springs, these are almost always seized if changing ride height is required. Steering is heavy as standard. There's probably a 90% chance the air conditioning won't work. The pipes which run to the condenser rot away. The cooling fans are also known to have issues. Low speed should come on at 97c and high speed 107c. Check the airbag light comes on and goes off when the car is started. The connections under the front seats can cause issues which causes it to flash. Electric window and central locking faults are likely to be caused by the loom between door and main body. On GTi-6 and Rallye the oil temperature gauge acts as a oil level gauge when ignition is first turned on. Autowipers can be erratic but this is mostly easily fixed by cleaning the contacts on the wiper motor. The doors are seemingly made of tin foil and will dent very easily, unfortunately most cars will have car park dings by now. Rust is not generally an issue due to the galvanised shells. One place to check is the near side rear seatbelt top mount (if you can remove the c pillar trim) as there have been an alarming number of cases of this being completely rotted through on forums recently. Fabric covering door cards is known to come away from trim. Check ultrasonics alarm works by locking car with window open, waiting 1 minute and then waving hand inside. Indicators should flash when alarm is armed. Check the engine is not warmed up, this could mask many problems. Check the paint work for mismatched colours, this could indicate the vehicle has been in an accident. Check the gaps between panels, if they are uneven chances are the panel has been replaced/repaired (badly). Check all tyres for uneven wear e.g. on the inside or outside edges, this could indicate a suspension issue. Lift the boot carpet to check for crash damage. Never make a final decision in the dark or wet. Buy on condition/service history not mileage. Ensure the seller has the V5 present. On the test drive, listen for knocks when driving and try and go to a car park and turn lock-to-lock, this will highlight many suspension issues. 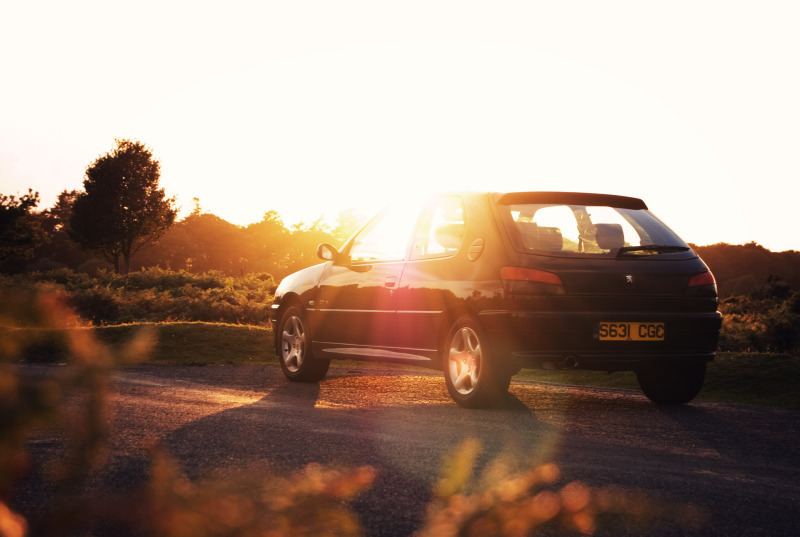 Hopefully that hasn't put you off, the Peugeot GTi-6/Rallye is a true classic of its time and the driving experience is unlike anything modern hot hatches can offer. The amount of feedback between road and car is pure driving enjoyment and extremely confidence inspiring. Anything to add to this buying guide? Please comment below.